Roald Dahl has been one of my favorite authors since childhood. I tried to start a reading project a couple of years ago where I re-read all of his works in the order they were published. School and life got in the way, but after re-reading Matilda, I think I absolutely have to re-read Dahl's works! 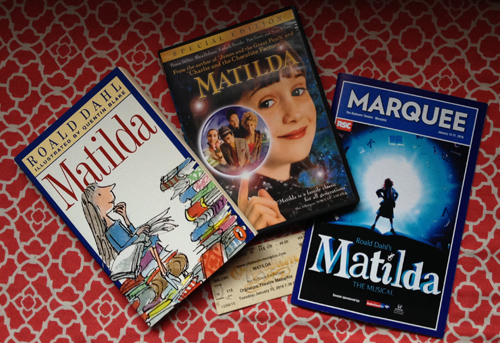 I re-read Matilda because my husband and I had tickets to see Matilda the Musical at the beautiful Orpheum Theater. I wanted the story to be fresh in my mind because I love comparing the book to the movie, or in this case, the play. I was only halfway through the book when we went to see the play, but I liked it that way - I couldn't remember the original ending, so the play was still somewhat suspenseful. The book was still so enjoyable as an adult; the text is straight-forward and easy for even young readers to understand. Dahl's insulting language is so creative that it will encourage vocabulary expansion in readers! My husband and I both really enjoyed the play. It's hard to review because... it's amazing. I would have gone to see it again the next night if I could have! The stage looks fantastic with all the letters and colors and blocks, and it pulls you right into Matilda's world. The actors are perfect in their roles. We saw a native Memphian play Matilda on opening night, so that was a nice perk! The next day, I finished the book and watched the movie. I remember seeing the movie as a child, but it's just as good as an adult! The movie differs a little in that there are some added scenes involving Matilda, Miss Honey, and Trunchbull, but this storyline fits in with the overall story, and isn't a major discrepancy like some plot changes are in movies. As an added bonus, Quinn Mattfeld, who played Mr. Wormwood, came to the Central Library on Friday and read the opening of Matilda! I think it's so cool that actors from a major traveling production would take time out of their rehearsal-filled days to read to kids!